The national rugby union teams of Scotland and South Africa (the Springboks) have been playing each other in Test rugby since 1906, and as of June 2014, they have met in 25 Test matches. Their first meeting was on 17 November 1906, and was won 6-0 by Scotland and their most recent match was on 28 June 2014, and was won 55-6 by South Africa. South Africa have won the majority of games played between the two sides, with 20 victories in the 25 matches. They are also the only team to win an away match between the sides, having won 13 times in Scotland. South Africa have won all seven of their home games. Since South Africa's rugby re-admission in 1992, South Africa has dominated once again, winning 15 of the 17 encounters between the two. 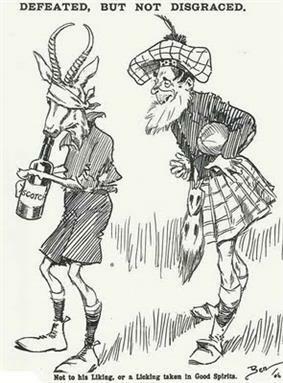 The 1906 match between Scotland and South Africa was South Africa's first official international rugby tour. It was also the tour in which the Springbok nickname was coined. South Africa lost to Scotland, defeated Ireland and Wales and drew with England. They also played a game against a representative French side drawn from two Parisian clubs and won.